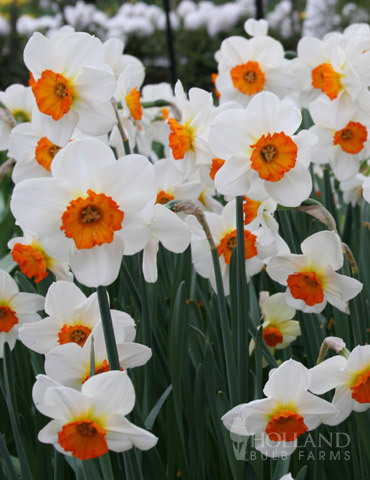 The 'Geranium' Tazette Daffodil is a magnificent, fancy white daffodil which is also great for cutting! Its white blooms form in heavy clusters of 3 to 5 which are easily supported by the sturdy flower stems. The bright tangerine center help to define each individual bloom and make these wonderful for coupling with other orange spring blooms. The sweet fragrance of the blooms is an extra added bonus of these gems! These little beauties have an awesome fragrance. They are cheery and bright. They are already naturalizing! The bulbs arrived at the right time and they look healthy. Spring will tell me how many sprout and whether they look as good as their picture.